What do you see in a blank page? 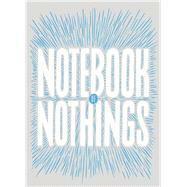 Next time you open a notebook, don’t go the easy route and assume that space is pure nothingness. Don’t look at the page and think its unclaimed territory is waiting for the gift of your writing utensil. Before you go jotting down your dreams, notes, and lists, give that blankness your full attention. Consider the substance in nothing. Within the Notebook of Nothing, you’ll find pages and pages of substantive white space and illustrations of various kinds of nothing, both tangible and conceptual. From pomp with no circumstance” and the combination of all visible light” to the part of the donut that doesn’t matter,” you will never not notice free space and all of its meaningful possibilities again. McSweeney's is a publishing company based in San Francisco.